With summer officially here, and seasonally stifling heat and humidity across wide areas of the U.S., many consumers will hope that their home air conditioners make it through another season. For those who don't want to rely solely on hope, some regular maintenance can help the appliance operate more efficiently and perhaps extend its life. A good place to start is making sure you understand how a central air conditioner works. In most applications, the air conditioner works with an existing forced-air system to cool and circulate air. The air is cooled and moisture is removed when it passes over an evaporator coil, the main component of the system located inside the house. The “conditioned” air is pushed through the ducts into the home while room-temperature air is pulled into the furnace's return air duct, beginning the cycle all over again. The condenser unit, the most visible part of the air conditioner, is located outside the home. Both it and the evaporator coil are sealed systems and need attention from a professional technician, but Trane, a major air conditioner manufacture, suggests a number of helpful maintenance steps consumers can take, like cleaning the evaporator. The evaporator is usually located above the furnace in the plenum, which is a sheet metal box that is used as a central manifold for other duct work to connect to. Carefully remove the insulation from the front of the plenum, which may be held in place by tape. Remove the screws securing it to the plenum to gain access to the evaporator. According to Trane, the underside of the evaporator should be cleaned with a stiff brush. When the coils are free of dust and dirt, clean the tray below the evaporator, then replace the access panel and insulation. A clean evaporator makes for a more efficient cooling process. If you're not comfortable cleaning the evaporator yourself, a professional technician can do this as part of your system's annual maintenance. The Department of Energy recommends cleaning your air conditioner's filters, coils and fins to keep the unit running efficiently. Neglecting necessary maintenance ensures a steady decline in air conditioning performance while energy use steadily increases. Clogged, dirty filters block normal airflow and reduce a system's efficiency significantly. Air may bypass a dirty filter and carry dirt directly into the evaporator coil, reducing its cooling ability. In central air conditioners, filters are usually located somewhere along the return duct's length. Common filter locations are in walls, ceilings, furnaces, or in the air conditioner itself. The evaporator coil and condenser coil collect dirt over months and years of use. A clean filter slows the dirt build-up. To avoid this build-up, check your evaporator coil every year and clean it as necessary. Try to minimize dirt and debris near the outide condenser unit. Yard debris is a condenser unit's biggest enemy. Cleaning the area around the coil, removing any debris, and trimming foliage back at least 2 feet allow for adequate airflow around the condenser. The best time to perform this maintenance is at the beginning of the season, just before you're about to begin using the system. If it needs professional attention, that's the best time to schedule it. 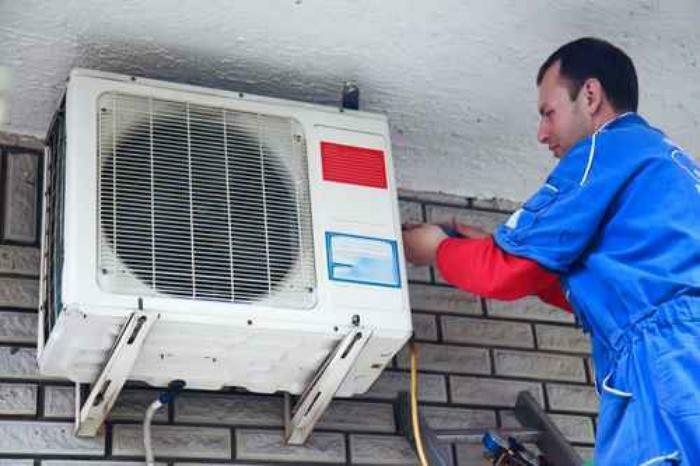 If you wait until your air conditioner stops working on the hottest day of the summer, it may be a while before a service technician can get there. Are Samsung washing machines prone to cause flooding?